A dreadful modernization, or rather Americanization of Jules Vern's underwater masterpiece. In this variation of the original 1870 novel, an elite submarine until is sent on a rescue mission where they encounter the villainous Captain Nemo. The crew must now escape his clutches, rescue their fellow sailors and thwart Nemo's scheme to build an underwater city. Sci-fi and Jules Vern fans will get very little out of this film. It has taken the raw material and over simplified it to the point where it becomes Navy propaganda, rather than science fiction. 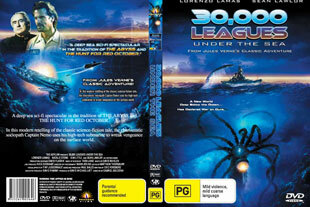 As a film in it own right, 300,000 leagues is little more than a middle of the road action film. The characters and the dialog are a mixture of stock standard action flick cliches. In short don't except to much from this film and you wont be disappointed.